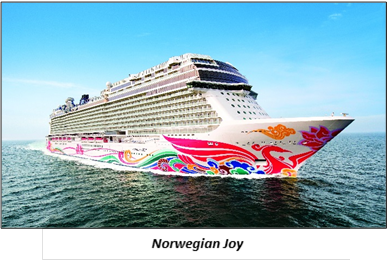 Norwegian Cruise Line, the innovator in cruise travel, today announced a free and reduced roundtrip airfare offer for new reservations on Norwegian Joy’s seven-day Alaska itineraries beginning April 2019 through September 2019. The offer will be available to the general public for one day only on September 14, with past guests gaining early access on September 13. New bookings for a balcony or better will be eligible for free or reduced roundtrip economy class airfare for up to two guests from over 100 airports across the U.S. and Canada. Guests reserving The Haven or Concierge level will receive complimentary airfare at all eligible airports. Guests may opt for a discount up to $1,000 per stateroom instead of the airfare offer. The Free Air promotion is also combinable with Norwegian’s Free at Sea offer, where guests can select up to five amenities of their choosing. Norwegian Joy will cruise a variety of itineraries featuring Juneau, Ketchikan, Skagway, Holkham Bay and Icy Strait Point, long recognized for its untouched wilderness, rich culture and fresh seafood. She will also call into Victoria, British Columbia. Following her first season in Alaska from Seattle, she will remain on the west coast with cruises to the Mexican Rivieraand Panama Canal from Los Angeles, as one of the newest and largest ships in the area, growing the brand’s presence in the underserved market. The Free Air promotion will be available on September 14, with past guests gaining early access on September 13. It is only available with seven-day Alaska itineraries on Norwegian Joy and is based on availability. The offer includes roundtrip economy class airfare from select airports. It is not applicable with Sail Away categories. Additional terms and conditionsmay apply.